Smibbs is a natural skincare company started by MSc Planning student Joe Smithyman. Born out of Joe’s own battle to overcome a skin condition that affected him as an undergraduate, the products use natural ingredients to help customers ‘take back their skin’. Joe’s company was originally chosen as the University of Plymouth’s entry in the non-technology category of the awards, with EKO Robotics, which offers high-tech drone solutions to the targeted aid and relief sectors, the choice in the technology class. EKO, a team of students and graduates led by current second year 3D Design student Joachim Tilling and BEng Mechanical Engineering graduate Avinash Sithale, just missed out on a place in the final. The competition involved more than 1,000 student and graduate businesses across the country this year, with each of Santander Universities’ partner institutions running an internal selection process to find their two entries. Each of these submitted a business plan and two-minute video and just 60 – thirty in each category – were chosen to progress to the semi-finals. Given just five minutes to pitch, and another five minutes to answer questions from the panel of experts, Smibbs Skincare was one of the judges’ picks to advance to the final stage, where Joe will compete for a prize of up to £25,000. Joe delivered a powerful and professional presentation, mixing his personal story with a clear understanding of his market and business model, and a sense of social purpose that impressed audience and judges alike. As a result of being selected as a finalist, Joe and his business partners will benefit from an ‘accelerator week’ of intensive training and mentoring, before pitching for one last time in the final in November. Smibbs Skincare and EKO Robotics are clients of Formation Zone, the University’s award-winning on-campus business incubator. Both won prizes in this year’s Formation Zone Business Challenge and have been supported throughout the competition by the team. “I congratulate Joe, and his fellow semi-finalists from EKO Robotics. 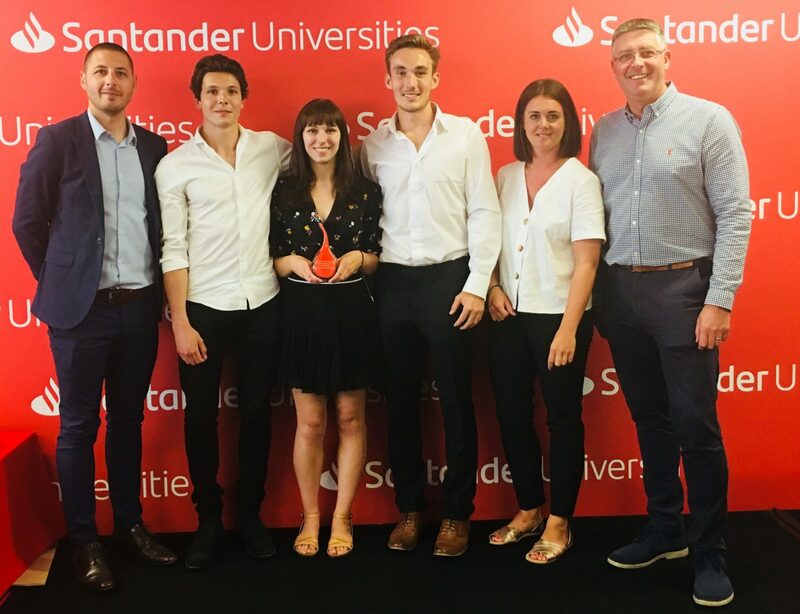 This competition and the boost it gives to student businesses and employability are further evidence of the benefits of our close relationship with Santander. Smibbs Skincare and EKO Robotics took part in the south region semi-finals held in Finsbury Square, London. The grand final will also take place in London in November.